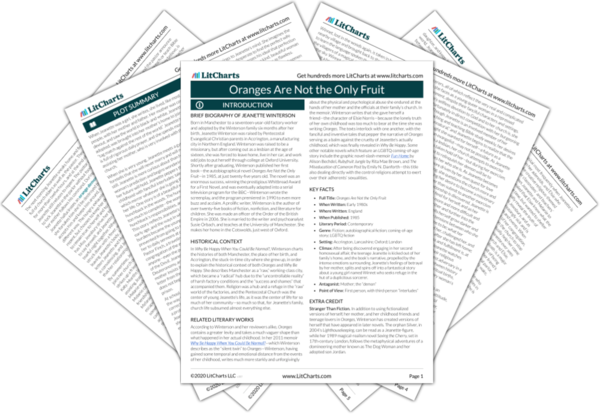 Instant downloads of all 945 LitChart PDFs (including Oranges Are Not the Only Fruit). 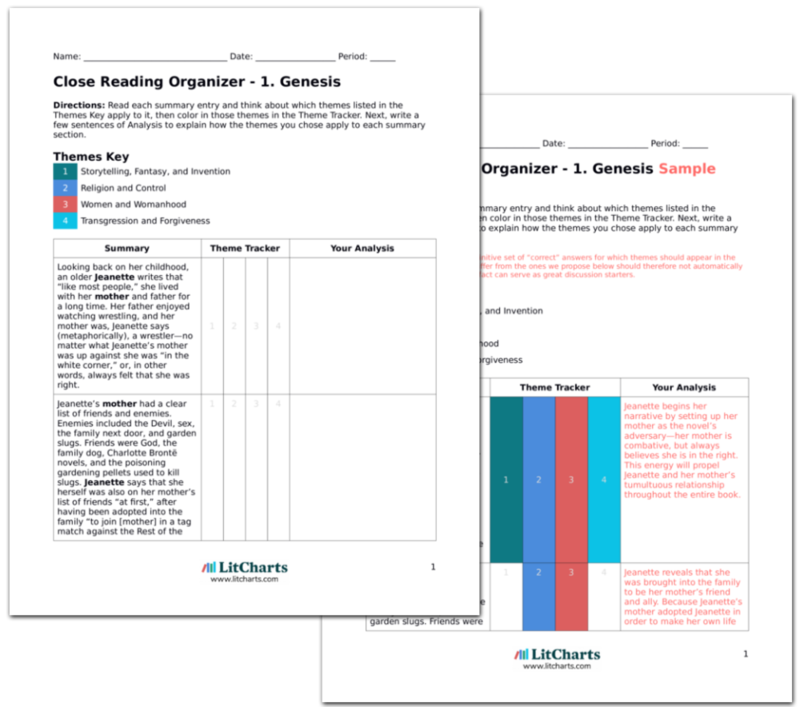 LitCharts assigns a color and icon to each theme in Oranges Are Not the Only Fruit, which you can use to track the themes throughout the work. Though the audience does not expressly know what’s happening at the start of this passage, it is easy enough to figure out: Jeanette has been discovered “sinning” again, and now there seems to be no forgiveness left for her—from her mother or from anyone in the church. Jeanette takes her Bible and walks up the hill with her family’s beloved dog in tow. Jeanette considers the fact that she “love[s] the wrong sort of people”—namely, she engages in romantic love with other women. Her mother has accused her of “aping men,” but Jeanette considers that statement far from the truth, to say the least—she embraces her own womanhood and retains her childhood distrust of and disdain for men. Jeanette reflects on how, after her exorcism, she continued to love God and the church, but began to see that love as increasingly complicated. Jeanette reveals that she has abandoned all plans to become a missionary, no longer willing to devote her life to the service of the church. Jeanette takes herself on a walk and contemplates what is “wrong” with her. She knows that she can’t help loving women, but where her mother sees this desire as unnatural, Jeanette knows it to be an inextricable part of her identity. Jeanette, faithful as ever, worries that her faith is seen as false because her identity is directly in opposition to the church’s beliefs. Feeling rejected and angry, Jeanette has decided to stop giving so much to an institution and a tradition that only scorns and punishes her for living her truth. Jeanette launches into a tale of Sir Perceval, the youngest of King Arthur’s Knights of the Round Table, who has just set out from Camelot. King Arthur has begged Perceval not to go—the quest he is setting out on is no ordinary one, but the Knights of the Round Table have all left their King’s hall, and the Round Table is “almost [a] symbol now.” There is a stone that holds a bright sword, but no one can pull it out. King Arthur sits on the steps of his castle staring at the Round Table, which is decorated with every plant imaginable. At the center of the table is a sundial and a thorny crown. Arthur thinks of the past, “when there were lights and smiles,” and misses Sir Perceval. The tale of Sir Perceval starts in this chapter and continues through the rest of the book. Perhaps the most inscrutable story-within-a-story that the book presents, Perceval’s tale can be interpreted a number of ways. As Perceval leaves Arthur behind, it is unclear what Arthur represents: is Arthur the church, which Jeanette is turning her back on? Is Arthur Jeanette’s lover Katy, whom Jeanette will inevitably have to leave? As the story progresses some answers will become clearer, but this mutable story of loss, abandonment, and longing is more thematic and atmospheric, at least right now, than one that tracks Jeanette’s “real-life” decisions in a precise allegory. Jeanette reveals the reason she is being kicked out of the house: she and Katy were caught red-handed due to a momentary loss of foresight. In the wake of being found out, Jeanette comforted Katy—truly comforted her—and put her storytelling skills and inventive mind to use as she struggled to find a way to keep her beloved girlfriend out of harm’s way and free from the cruel punishments of their churchgoing community. 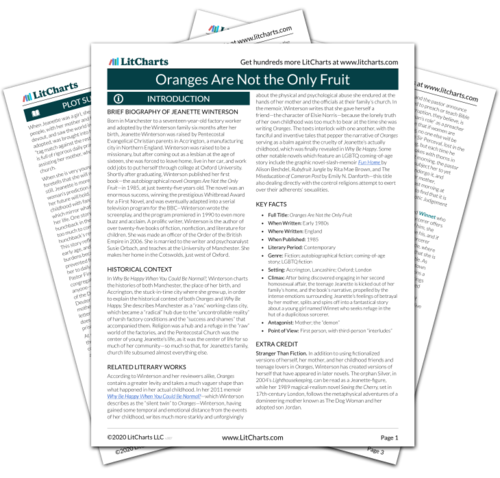 Get the entire Oranges Are Not the Only Fruit LitChart as a printable PDF. At breakfast the next morning, the two girls are summoned to the office of one of Jeanette’s mother’s friends, who had once been the treasurer of the Society for the Lost. The woman demanda the truth. Jeanette spins a story in which her affair with Melanie had never really ended, and says that after months and months of heart-rending correspondence with Melanie, Jeanette had begged Katy to help her arrange a meeting with Melanie in Morecambe. Jeanette’s mother’s friend believes her, and Jeanette’s plan works—the ex-treasurer doesn’t want to bother Katy’s parents with the explanation, so Katy is left unpunished and undiscovered, while all the blame is forced onto Jeanette, who doesn’t want the church to “start the demon stuff” up with her beloved Katy. Jeanette packs up and prepares to go home after spending one final, tearful afternoon with Katy at the beach. Jeanette does not want Katy to be subjected to the same pain, torture, and shame that she was, and so agrees to take the fall—after all, the church has already put her through the worst thing she’s ever gone through, and now she knows she can handle it. Jeanette does not want Katy to be told she has an evil demon, though Jeanette feels that the demon within her herself is what has been driving her to fight for her own desires, her own agency, and fulfillment of her own life. Jeanette and Katy break things off, which is for the best, though it brings them both deep pain and sorrow. Jeanette’s mother, who has grown more distant from her daughter over the course of the last year, reacts in wild, unthinking rage. Jeanette’s mother thought her daughter was “back to normal” and had “exorcised” all her demons, and to discover that the opposite is true brings her great shame. Knowing she alone cannot control Jeanette any longer, Jeanette’s mother calls upon one of their church’s pastors (again unnamed as either Spratt or Finch) to help her with Jeanette, believing that something much darker than just natural desire is working on her daughter. Jeanette’s mother wails in agony, then begins blaming Jeanette for giving in to her own perversity. Jeanette’s mother and the pastor argue between themselves whether Jeanette is a victim or a wicked person, and Jeanette listens, bemused. Suddenly, seven ripe oranges drop down onto the windowsill, and Jeanette asks her mother and the pastor if either of them would like an orange. Jeanette’s mother proclaims that Jeanette has gone mad, but the pastor insists that it is Jeanette’s “master” speaking through Jeanette—meaning the Devil. The pastor, stating that Jeanette’s case has become too difficult for him to manage, instructs Jeanette’s mother to keep an eye on her, ignore her raving, and let her continue attending church. The two leave Jeanette in peace, and she stares for a long time at the oranges, realizing she is going to “need more than an icon” to get her through this latest trial. As Jeanette finds herself once again at the mercy of her fanatical mother and her demon-obsessed preacher, she finds herself hallucinating a symbol of comfort: oranges. Jeanette attempts to offer these oranges to her mother and her pastor, to soothe them as oranges have been offered to her to blandly soothe her all her life, but when her mother and pastor realize that Jeanette is hallucinating they become even more frightened of the state she’s in. Even Jeanette realizes that things are more dire than they’ve ever been, and she will need more than a false symbol of comfort and hope to get her throughout whatever is coming her way. The next day, Jeanette attends the Sisterhood meeting at her church. It is the first time Elsie has been in attendance for a long while. Elsie knows what is happening, but holds Jeanette close and comforts her, and discreetly invites her over for a cup of tea after church. As the meeting begins, the other women become hysterical each time they meet Jeanette’s eye, and everyone is relieved when it’s finally over. Jeanette is still allowed to go to church in hopes that her soul can be saved, and at the Sisterhood meeting, she is able to connect with an old friend, Elsie, who offers her genuine support, comfort, and solidarity, while the rest of the women treat Jeanette like a leper—or worse. After the meeting Jeanette goes to Elsie’s, who reveals that Miss Jewsbury has moved to Leeds, is teaching music, and is “not living alone.” Elsie confesses to Jeanette that it was she who told Miss Jewsbury about Jeanette’s affair with Melanie. Elsie laments having gotten sick and being forced in and out of the hospital, telling Jeanette that she would have “sorted [both her and Melanie] out” had she not fallen ill. Jeanette hugs Elsie and the two of them sit by the fire, not talking about much of anything. Jeanette is grateful to Elsie for having given her the gift of an ordinary evening spent with a friend. Jeanette leaves, and Elsie tells her to come back whenever she needs to. Elsie laments not being able to help Jeanette, and wishes she could have been able to head off all of Jeanette’s woes and troubles before they came to fruition. It’s unclear whether Elsie would have encouraged Jeanette to “keep her demon” and be herself or would have tried to dissuade her from pursuing relationships with women, but that hardly matters now—Elsie has been the only member of the congregation to show Jeanette true care and kindness, and Jeanette is deeply grateful for Elsie’s support. As Jeanette is forced to endure yet another ambush in church, this time the stakes are even higher. Jeanette’s position within the church is not the only thing being threatened—now the pastor is planning to take away power from all women within the church, though women have been shown to be the backbone and the heart of the institution throughout the novel. Jeanette’s mother’s most recent betrayal stings even more deeply, as Jeanette’s mother always told her growing up that she was “special” and had the power to change people’s hearts and minds. Suddenly, a voice cries out that all Jeanette’s mother has said is a “load of old twaddle.” Jeanette turns around and finds that it is Elsie who has spoken up. Elsie dissolves into a coughing fit, clearly agitated, and then falls over. Jeanette runs to the back of the church to help Elsie, but the others hold her back. While some members of the congregation bundle Elsie in her coat and help her home, the pastor approaches Jeanette and demands she give up all preaching, Bible study teaching duties, and any “influential contact.” He also tells Jeanette of his intention to subject her to a “further more powerful exorcism” followed by a two-week banishment, alongside her mother, to recover by the sea, once she has agreed to his terms and begun to repent. Jeanette tells the pastor she is tired, and heads home. Elsie once again speaks out and stands up in support of Jeanette, but she is very old, and the effort takes a toll on her. As Elsie is taken away Jeanette is not even allowed to tend to her friend—she is forced to stay behind with the pastor and be talked down to, shamed, and threatened with even more corporal and psychological punishment, as well as effective banishment from the church and the town until she agrees to sever her contract with her “demon.” Jeanette is just plain exhausted at this point, and refuses to engage with the beast-like man who wields such power in the institution Jeanette once believed was good, pure, and just. The narrative switches over to the story of Sir Perceval, who has been wandering in the woods for many days. He can see the tracks of other knights who have tread this path. He seeks a ruined chapel, which lies “disused and holy” somewhere in the woods. Last night, he dreamed of the Holy Grail moving toward him ensconced in a beam of light. He reached out to touch it, but when he awoke his hands were full of thorns. Tonight, he dreams instead of Arthur’s court, where he was the King’s “darling.” Perceval dreams of his old friends, but knows that they are all now dead. He dreams of King Arthur sitting despondent on a stone step, holding his head in his hands. Perceval reaches out to embrace King Arthur, but wakes up clutching a tree covered in poison ivy. As Jeanette continues on, she grasps again and again for the things she wants—power within her church, relationships with women she loves and cares for, and friendships with members of her congregation who share the same beliefs and values. At every turn, though, Jeanette is wounded and attacked. Perceval’s struggle to grasp for Arthur and the Grail in his dreams mirrors Jeanette’s failures to attain the things she most wants, and failure to protect herself as she pursues them. The next morning, the pastor comes to Jeanette’s house for tea. He asks when he should book her and her mother for their “holiday,” but Jeanette does not answer. Jeanette tells the pastor she refuses to go—she is leaving the church. The pastor and Jeanette’s mother beg her not to leave, and even offer to let her continue teaching Bible study under supervision. Jeanette refuses. The pastor at last asks Jeanette one final time if she will repent, and she tells him she won’t. Jeanette has made a decision not to hurt herself anymore in the name of her church. She tells her mother and her pastor that she will no longer be a member—she would rather leave the church, the bedrock of her entire life, than deny herself the chance to live freely, without fear or shame. The pastor and Jeanette’s mother retreat to the parlor for half an hour, and then the pastor leaves. Jeanette’s mother tells Jeanette that she has to leave—she will not allow demons in her house. Jeanette protests that she has nowhere to go, but her mother tells her that “the Devil looks after his own,” and pushes her out of the house. Jeanette’s mother, believing her daughter to be possessed, kicks her out of the house and tells her that if she wants to hang onto her demon, then it’s demons who’ll look after her. Jeanette’s mother never really loved Jeanette for who she was as a person, but only for what she represented and could do for Jeanette’s mother herself. Jeanette’s mother knows she can’t control her daughter anymore, and lashes out in pain and anger. On her last morning at home, Jeanette empties the trash and walks the dog. Jeanette cannot imagine what will become of her. She is surprised to find that this last day at home does not feel like judgement day, but rather like just another morning. Jeanette cannot believe that she is leaving home, and more than that, is astounded by how anticlimactic it all is—the end of her childhood, the end of her religious life, and, presumably, the end of her torturous relationship with her mother. Tanner, Alexandra. "Oranges Are Not the Only Fruit 7. Judges." LitCharts. LitCharts LLC, 13 Apr 2018. Web. 23 Apr 2019. Tanner, Alexandra. "Oranges Are Not the Only Fruit 7. Judges." LitCharts LLC, April 13, 2018. Retrieved April 23, 2019. https://www.litcharts.com/lit/oranges-are-not-the-only-fruit/7-judges.